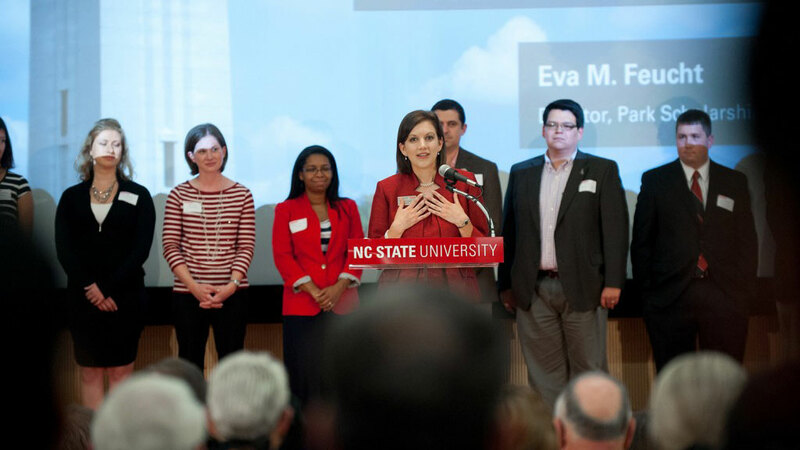 Eva Feucht, director of the Parks Scholarship program at NC States talks about the significance of the program at NC State. In the mid-1920s, at just 15 years old, Roy H. Park, Sr. graduated high school and enrolled at NC State University. Twenty years after his passing, Roy’s legacy has been firmly cemented at NC State with a $50 million gift from the Park Foundation—the largest single contribution in NC State’s 126-year history—to help permanently fund the university’s prestigious Park Scholarships program. Together with additional donor support, this gift will enable an endowment to provide income in perpetuity to attract the brightest minds to NC State and help them realize their full potential in scholarship, leadership, service and character. “If my father were alive today, this would be one of the most exciting days of his life. He loved this school and credited it with his success,” Adelaide Gomer, Roy’s daughter and the president of the foundation that bears his name, said. “NC State was one of his major beneficiaries because he perceived scholarships as a way that his legacy could ‘pay it forward’ to assist future generations, a gift that keeps on giving,” she said. Of his many contributions to the university, Roy’s greatest legacy at NC State is the Park Scholarships program, established in 1996 just three years after his passing. Since the inaugural class of 25 Scholars, the number of Park Scholars has grown to over 200 on campus. The Program has established a legacy of leadership and service in the spirit of the Park name. This merit-based scholarship program offers NC State the ability to attract top students from across the state and nation. “This influx of talent and ability to NC State improves the learning environment for the entire campus community. Many of these impressive young people stay and work in our state after graduation,” NC State Chancellor Randy Woodson said. “The Park Foundation has made an investment in a program that aims to select students who will one day make lasting contributions to the betterment of society. These students repay that investment many times over in their service and efforts to solve grand challenges. Park Scholars do an exemplary job of carrying out NC State’s mission to create economical, societal and intellectual prosperity,” he said. “Through their exceptional generosity, the Park Foundation has demonstrated their tremendous passion for higher education, ensuring that the life-changing gift of education will be available to promising young men and women now and well into the future,” Chancellor Woodson said. The Park Scholarships program annually selects approximately 45 scholars and provides them a four-year scholarship, a computer stipend, enrichment grants, specialized faculty mentoring and a wide variety of experiential learning opportunities. In addition to working individually on academic and professional activities of personal interest, Park Scholars participate in numerous extracurricular activities, including student government, varsity and intramural athletics, fraternities and sororities, academic and cause-related clubs, entrepreneurial ventures, and arts organizations. A commitment to service is one of the hallmarks of the Park Scholarship program. The program includes many formal opportunities for scholars to provide service on campus, in the community, across the state, and throughout the world; yet many Park Scholars take the additional step of founding their own service organizations and events to address previously unmet needs. Park scholars are responsible for both Service Raleigh, the largest student-run service endeavor in the Triangle area with more than 2,000 volunteers providing more than 6,000 hours of community service annually, and the Krispy Kreme Challenge, a running and doughnut-eating event known as a “top thing to do before you graduate,” which has raised more than $500,000 for North Carolina Children’s Hospital since its creation in 2004. Guided by these words, in 1951 he helped produce a product that would revolutionize the food industry, the Duncan Hines cake mix, which was later sold to Procter & Gamble. After serving on Procter & Gamble’s Board for five years, Roy launched Park Broadcasting Inc. in 1962—renewing his journalism career and establishing himself as a pioneer in the rapidly growing television industry. Park Communications eventually controlled seven television stations, 21 radio stations and 144 newspapers. The company’s market reach covered one quarter of all American households and employed 3,000 people a year. Throughout his career Roy never forgot his alma mater. In 1951, he helped create and promote the “Nickels for Know-How” program, which allowed North Carolina farmers to donate 5 cents on each ton of feed and fertilizer purchased to support the College of Agriculture and Life Sciences. He went on to work closely with the Alumni Association from 1957 to 1962, holding the offices of president and chairman on the board of directors and creating new avenues for the university to raise donor funds. In 1961, he initiated the Chancellor’s Circle, making the first donation of $1,000 himself. From 1962 to 1966, he was named chairman of the NC State Development Council, where his efforts helped propel the institution into the top ten for corporate support. He also served on the Board of Trustees from 1977-1985. In recognition of his tremendous service, he was bestowed with NC State’s two highest honors—the Watauga Medal in 1975, and an Honorary Doctor of Humanities in 1978. In 1989, he received equal attention from the state of North Carolina when it honored him with its highest civilian honor, the North Carolina Award.